Got a new subscriber to sign up to your list? Congratulations! You have successfully cleared the stage of ‘lead acquisition’. Now, how do you make sure that new subscriber gets connects with what they need from your world? A welcome email can help you do this. With every new subscriber, it’s important to set the right tone with them by sending a great welcome email to start their journey with you. Welcome emails have a remarkably high open rate of 50%. That makes them more effective than newsletters. Therefore, it’s crucial that you take time to get it right. 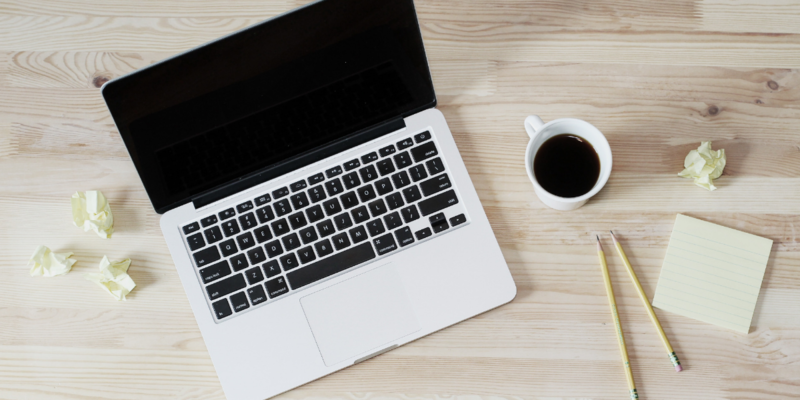 If you’re still stumped on how to get people to sign up for your mailing list in the first place, have a read through our complete guide on how to build an email list to sell more online courses. 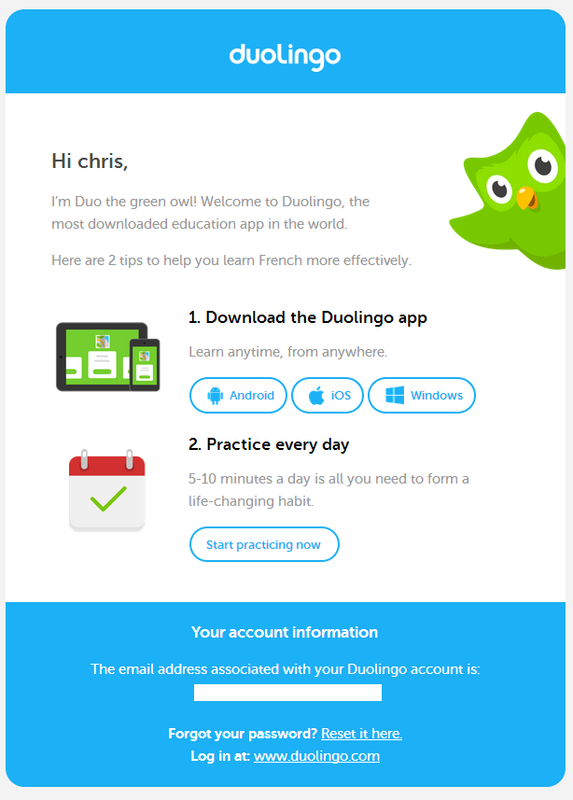 The welcome email, like the name suggests, is the very first email a subscriber receives upon signing up. The intention is to build a strong relationship with your new subscriber, turning them into a prospective customer. After giving up their precious email address, sending subscribers a welcome email is a great way of demonstrating that you appreciate the trust they’ve placed in you. A welcome email shouldn’t be a formal communication. Rather, it should greet them with a friendly message and highlight your unique selling proposition, making the subscriber curious to know more about you. Here are some key elements to include in your welcome emails. Thank the new subscriber for choosing to be a part of your organization. They chose to put their time and faith in your brand, so make it a priority to thank them. A simple “thanks for signing up” note could look like a plain-text email or include vibrant design with creative elements like images, GIFs or cinemagraphs. A welcome email acts as the handshake introducing new subscribers to your company. Before sending regular emails to new subscribers, your first priority should be to make them well aware of your organization and everything related to you. 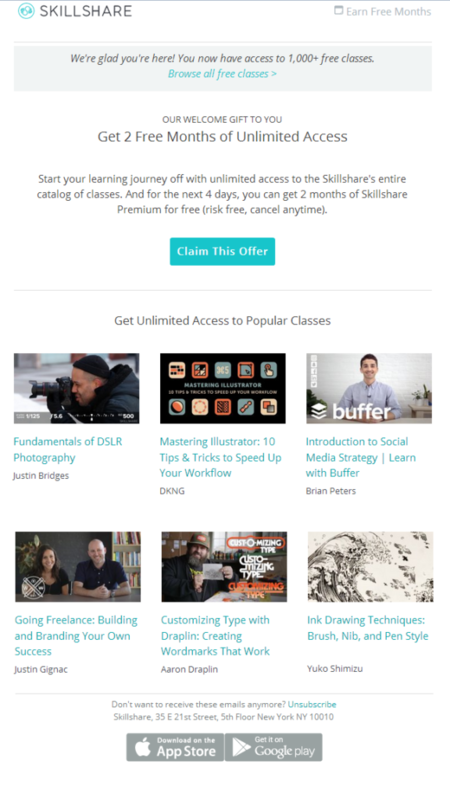 As an online course creator, you could share the courses that you offer along with the prices. Not all subscribers will have looked through your website before signing up for your newsletter, which is why you should make a point to introduce your brand – even if you think your subscribers know you. Pro-tip: Ask your subscribers to whitelist your email so that it doesn’t land in the spam folder. Let your new subscriber know what and how frequently they can expect emails from you. Inform them what it means to be in your subscriber list. For example, if you’re marketing an online course, tell them how many days a week can they expect to be sent new study material. For example, you could share the dates when the new modules will commence. 4) Start it with a “give and take” policy. Send your new subscribers exciting offers that they can’t resist. They have already shown their faith in your brand by giving you their email address, so it is time for you to give back something that they would love. For example, you could give them a free subscription to your study material for a week. You can ask them to enroll in a free trial course of their interest. This will help them understand the quality of your products and generate spontaneous responses to your emails. Here’s an example from Skillshare. They have a clear call to action that prompts the recipient to take advantage of the special welcome offer in the first fold, followed by a selection of their popular classes. 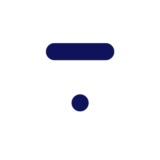 In the footer, they have strategically promoted their Mobile App. Make your welcome emails helpful for your subscribers. You can share FAQs along with any information that your subscriber should know about your brand. Give them an overview of how the subscriber can achieve their learning goals. Here’s an example by Coursera. Arizona State University provides detailed answers to the commonly asked questions. This increases the chance of conversions by making it easy for the subscriber to take a decision. A great way to engage your subscribers is by including your social media channels in your email. A good idea would be to add a “click to tweet” option in your email so your new subscribers can tweet about it, and let their connections know about your brand. 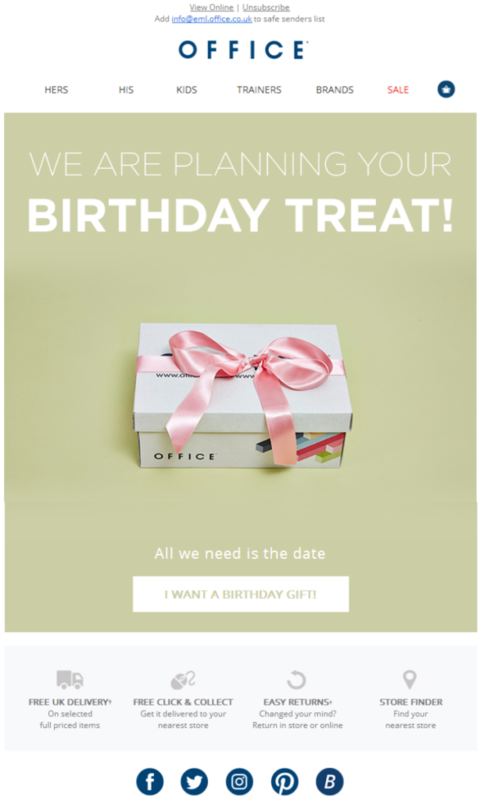 Pro-tip: Leverage referral email marketing to get more sign-ups for your brand. 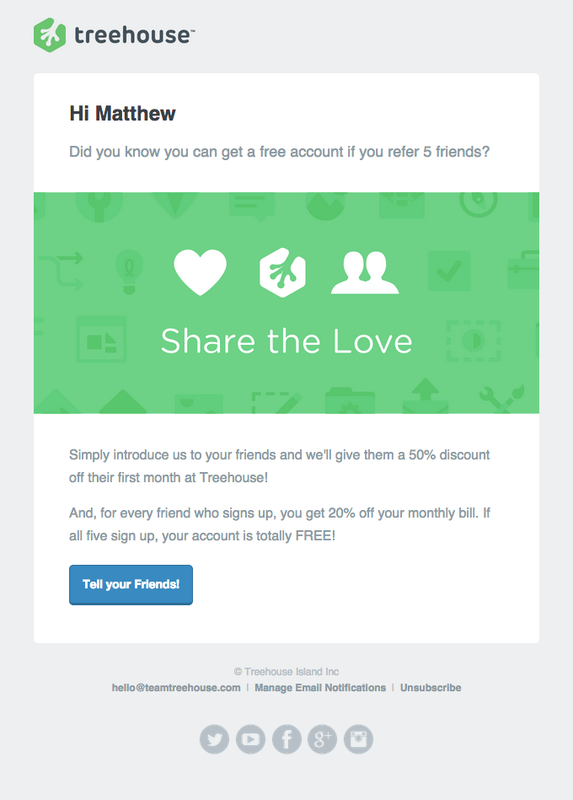 Treehouse sends a great email to encourage more referrals from their subscribers by offering a free account as an incentive. You will never be sure about the aspirations, tastes, or preferences of a new subscriber unless you ask. Welcome emails enable you to assess a subscriber’s perception of your brand as well as their expectations if you craft the email right. Let your subscribers set their preferences for the kind of courses they are looking for, and the frequency of your emails. Doing this right at the outset would help you send better emails after the welcome email. 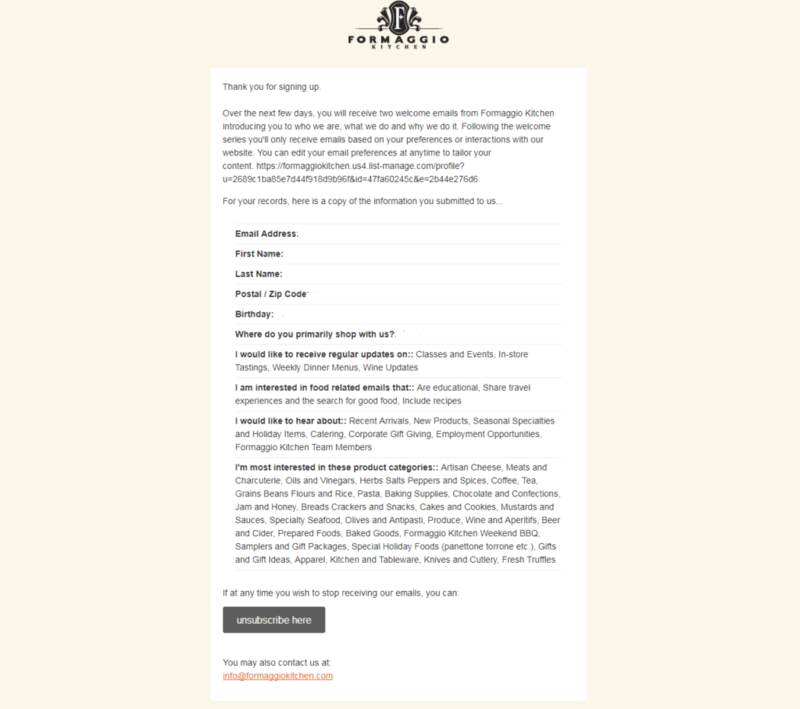 Here’s how Formaggio Kitchen lets the user set preferences before sending out their welcome email. Instead of sending a single welcome email, create a welcome series for your subscribers to nurture the relationship. To do this, you need to decide the time period for your welcome email series. 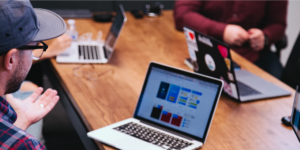 Also, make sure to connect your welcome email series to your overarching email marketing strategy to sell your online course. Your welcome series may include a thank you email, an introductory email, and an incentive email. Developing a series can cultivate a strong impression of your brand over time. Here’s another example to inspire you. To send a great welcome email, make a point to understand the needs of your subscribers first. That way, you will know how to craft your content in a way that serves them best. Get clear on your goals, focus on providing value, and stick to the email marketing best practices described above. 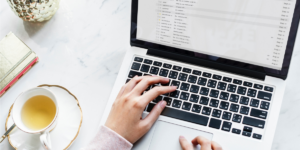 Once you have your welcome email written, make sure to connect it to an email automation strategy to get the most out impact out of your email marketing efforts. Kari Johnson has been living and breathing email marketing for the better part of a decade. Kari is connected to InboxArmy, an innovative email marketing agency that specializes in providing advanced email marketing services from email production to deployment. She brings experience working with a variety of clients ranging from big retail brands like Staples, to healthcare and nonprofit entities. Katie’s track record of success includes building email programs from scratch and using data-driven strategies to turn around underperforming accounts. When she isn’t dreaming up the next amazing subject line, you might find her out on the golf course or designing pallet tables.